Late last evening, this dog received a distress call from Preeti in Gurgaon. A kitten was heard stuck in a drainage pipe. From NGOs to local chapters of RWAs, all were called but in vain. Some suggested that the territory isn’t under their purview of operations, to others citing (in miffed voices) regarding the call being made out of working hours… ironically while seeking donations and aids in the name of animal welfare, we never come across such excuses. Anyways, humans and their ways, this dog knows little of. A kitten has got stuck in a drainage pipe – Sector 31, Gurgaon. Anyone who can help, please? Not sure as who to call, we tried Gurgaon Fire Station. To our surprise, they said they would help! 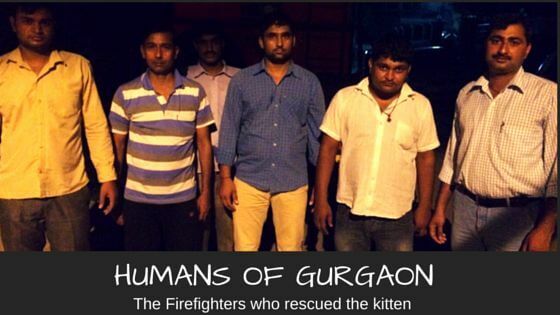 The firefighters of Gurgaon, arrived in time to save the little precious kitten stuck in the drain pipe. In the ever expanding satellite city to the capital, we keep hearing of mafia, mob, and mayhem; this time we came across men too. Men, who weren’t wearing t-shirts proclaiming “Being Human”, but being so with their act. Here’s to the Humans of Gurgaon! Posted on July 9, 2015 March 29, 2016 Author Abhishek JoshiCategories Hail the hound! I feel so happy when I see dogs are being taken care of. Next Next post: Can dogs count?